(Nanowerk News) Spotting molecule-sized features—common in computer circuits and nanoscale devices—may become both easier and more accurate with a sensor developed at the National Institute of Standards and Technology (NIST). With their new design, NIST scientists may have found a way to sidestep some of the problems in calibrating atomic force microscopes (AFMs). The AFM is one of the main scientific workhorses of the nano age. It can resolve features as small as individual atoms. Instead of magnifying with a lens, AFMs “feel” a surface, using a flexible cantilever with a tiny, sharp tip. As the tip passes near a nanoscale feature on a surface, interactions between the atoms on the tip and on the object’s surface cause the cantilever to bend, revealing the finest of details. Because the forces that cause the tip to bend are fairly weak, scientists have increased AFM sensitivity by making the tip vibrate at a particular frequency as it passes over the surface and measuring how much the frequency changes. Frequency can be measured more precisely than almost anything else in the physical sciences. The trouble comes in calibrating the tip’s sensitivity. AFMs operate well in a near vacuum at temperatures around minus 268 degrees Celsius. This means the tip and specimen interact in a tight space behind several walls—hardly an easy spot to cram calibration equipment. As a result, calibration entails removing the tip and checking it at room temperature, a process that not only can skew AFM results but requires calibration equipment that few people outside national metrology institutes possess. The NIST team’s sensor is a redesign of the device that makes the tip vibrate ("A self-calibrating optomechanical force sensor with femtonewton resolution"). Made of a silicate material akin to the quartz used in some wristwatches, the cantilever is a roughly three-millimeter-long rectangle that looks a bit like a hollow diving board. At the end where the diver would bounce is a mirror that reflects light shining from an LED. The LED can be adjusted to deliver a specific amount of energy. When the photons strike the mirror, they exert enough pressure to set the cantilever vibrating. The distance the tip travels upwards and downwards—measured by an interferometer—reveals how stiff the diving board is at that temperature. This is the critical figure needed to equate a change in the tip’s frequency to a change in atomic force. 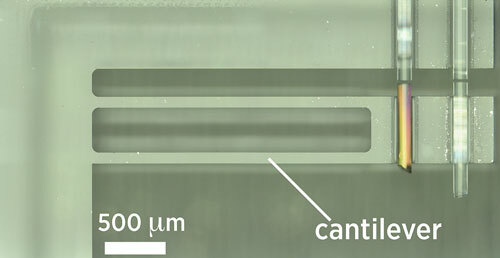 It is the first of a class of self-calibrating NIST-on-a-chip embedded standards that merges laser power, force and mass calibrations in a portable package that can be used in tight spaces, like the AFM.